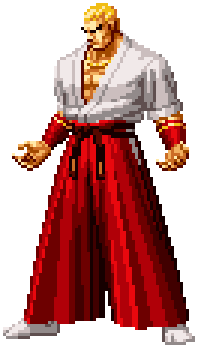 Geese Howard (ギース・ハワード) is the local crime boss of the fictional city of South Town and runs the company Geese Connections. He killed Jeff Bogard in front of his son Terry Bogard's eyes. In The King of Fighters '96 Geese Howard enters the tournament teamed with underling Mr. Big and his half-brother Wolfgang Krauser in an attempt to learn about and obtain the power of Orochi, a plan that fails. Geese survives an assassination attempt by a sniper hired by an enraged Mr. Big, thanks to the timely intervention of Billy Kane and returns to Southtown in the Boss team's ending. The following year in the next KOF game, The King of Fighters '97 Geese Howard organises the first Outlaw team, consisting of Blue Mary, Ryuji Yamazaki and Billy Kane and enters them to learn more of Orochi. Kane is sent to watch KOF main character Iori Yagami while Mary is sent to watch Yamazaki, as both of which are suspected to be part of the Orochi bloodline. At the games climax it is Yamazaki who transforms into Orochi and appears to die, but in his ending, returns to extract the money Geese owes him by force. This page was last edited on 10 February 2018, at 16:33.